The temples of Bangkok are covered in gold leaf, gold plate, or just plain gold! What was obvious to me after just a day of walking around the temples of Bangkok was that Buddha was a big fan of shiny metals! Unlike Singapore or Brunei in the world like Thailand was never colonised by a European power. Actually, apart from a minor hiccup when it was invaded by Burma, Thailand was pretty successful at keeping everyone else out. This is probably the main reason why so much of the valuable and shiny heritage in the temples of Bangkok is so well preserved. When the Burmese did ransack Bangkok plenty of things had to be hidden away. 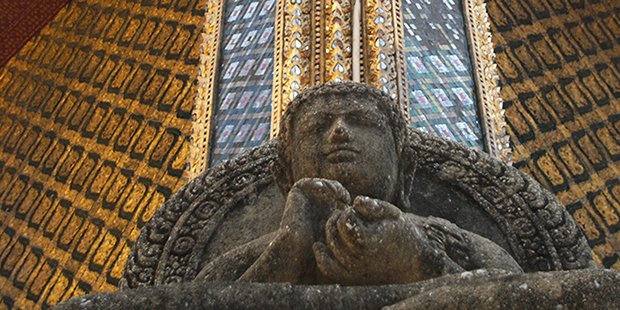 A five tonne gold statue of Buddha found in a Bangkok temple is one such example. The statue was only recently discovered. It had fooled everyone for centuries pretending to be made from plaster. I was expecting the statue to be one of the highlights of my trip around the temples of Bangkok. I mean there are few places in the world where you can stand so close to five and a half tonnes of gold without being arrested. The statue was shiny enough to attract a magpie, but I was left with a feeling of indifference. I think it has something to do with not being outside in the sun. Seeing lots of gold in the midday sun you understand why gold was, and continues to be such a valuable commodity. The large temple in the King’s palace is the perfect example of this. Just look at the photo, tell me I’m lying if you don’t find your eyes automatically drawn to the gold. 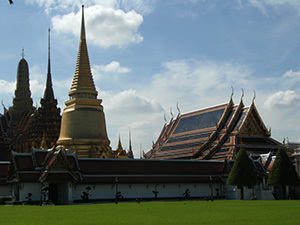 The temple is only one of the many things worth visiting in the palace complex. I really enjoyed walking around the grounds and taking in all of the different buildings. Each building has its own unique architecture. It’s a true infusion of styles with elements from many different regions of the world. At 15-metres high and 46-metres long, the statue of Buddha lying down was the last of the temples of Bangkok that I visited on my golden tour of the city. Because of its size it’s hard to get a good view of the statue. The fact that it’s surrounded by a small building, means that you are just two metres away from the statue most of the time (it’s still one of the best temples of Bangkok to visit though). I loved all the temples in Bangkok! They are so ornate and incredibly well made. Hi Spencer. I agree, Bangkok is really amazing for temples. I was really blown away. I’m going to Angkor Wat in two days days time, I’m hoping that it will be just as good. Have you ever been?